Grape and Granary offers a variety of Oak products for homebrewing. Use these oak chips and spirals in place of an Oak Barrel. 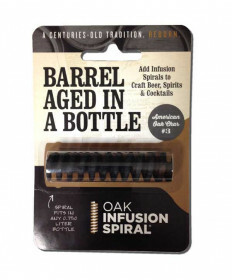 As a home brewer, you have the flexibility to experiment with many oak barrel alternatives that can add great depth of flavor and complexity to your beer. Try adding Gin, Rum, Whiskey or even Tequila barrel chips to a batch of beer. There are many styles of beer that will be complimented by oak including Imperial Stouts, Barley Wines and similar styles. Contact Us if you have questions about any of our oak products.